A book setting out the far-reaching implications of privatising social work has been unveiled by a leading academic from Kingston University and St George’s, University of London. In Whose Interest? The Privatisation of Child Protection and Social Work, by Emeritus Professor of Social Work Ray Jones, explores the impact of outsourcing crucial services, including those for families and children, to private companies. It discusses the challenges privatisation poses in the sector and the effect this approach is having on the quality and continuity of care. 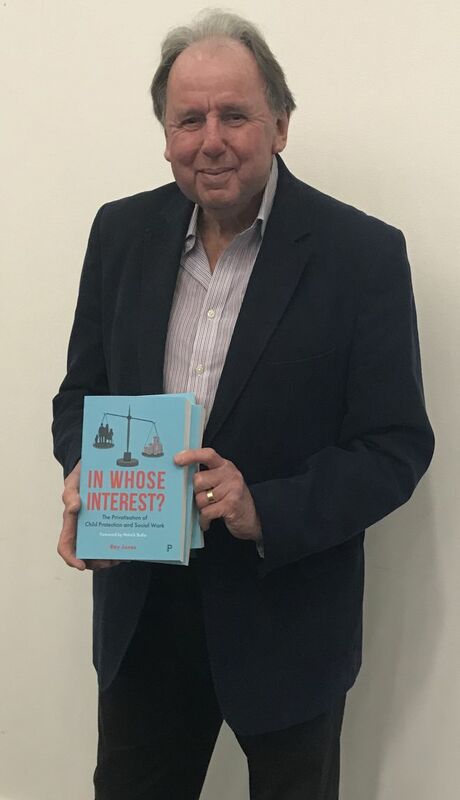 Professor Ray Jones with his newly-published bookThe social work expert, who has written a number of books on the topic, and also penned best-seller The Story of Baby P: Setting the Record Straight, said the sector had witnessed growing privatisation of services in recent years. Almost 80 per cent of children’s homes were now run by private companies, half of all foster carers were employed privately and around 20 per cent of local authorities were outsourcing children’s social care services. “It’s my view that there’s an alarming lack of continuity of care at the moment because providers are constantly changing and this trend is getting worse,” Professor Jones said. “To my mind, it would be more sensible to have these services run locally within the public sector. At the end of the day, the priority should be the quality of the service provided to those who need it most. At the moment I don’t feel that quality is high enough,” he added. An influential social work expert, Professor Jones has worked in the sector for almost 50 years. He was the first chief executive of the Social Care Institute for Excellence, chair of the British Association of Social Workers and served as an adviser to numerous government policy and research committees. He took up the role of Professor of Social Work at the Faculty of Health, Social Care and Education, run jointly between Kingston and St George’s in 2008 following a 14 year stint as director of social services for Wiltshire County Council. Last year he was honoured for his outstanding contribution to social work at the Social Worker of the Year Awards. Find out more about studying social work at Kingston University.